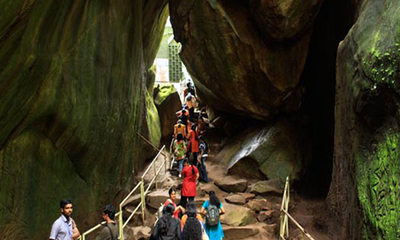 Twenty five kilometers away from Kalpetta lays two caves which showcases nature’s skill and philosophy on architecture. These caves are located 1,200 m above the sea level on Ambukutty Mala. The name ‘Edakkal’ literally means ‘a stone in between’. Here you can see a cave formed by a heavy boulder straddling a fissure in the rock. Many legends are there behind the formation of Edakkal caves. One of the stories is that, these caves are said to be formed with the arrows fired by Lava and Kusha, the sons of Lord Sri Rama. Another one is associated with Kutti Chathan and the Goddess Mudiampilly. The local people used to have a pilgrimage trip to this place to honour the Goddess. The caves were discovered by Fred Fawcett, the then Superintendent of Police of the Malabar district in 1890, during his hunting trip to Wayanad. 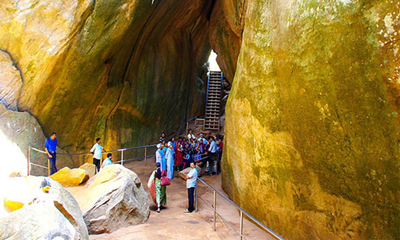 He discovered the Edakkal rock-shelter, situated on the western side of Edakkalmala. To his surprise, he identified the place as a habitat of Neolothic people. Edakkal caves are famous for its pictorial paintings (cave paintings), which are considered to be of 6000 B C. To reach the caves, one has to trek through the Ambukutty Mala. It will take around 45 minutes to climb the hill and you will never get disappointed in your trip to these historic caves. Inside the cave, you can see two chambers. The lower chamber is 18 ft long, 12 ft wide and 10 ft high and the upper chamber is 96 ft long, 22 ft wide and 18 ft high. You can sight carvings of human, animal figures and objects used by humans, on the walls of the caves. These carvings give great evidence for a highly civilized society who lived in the pre-historic age. Edakkal caves have drawn great attention of archeologists and historians worldwide. Edakkal is the only known place in India with Stone Age carvings. 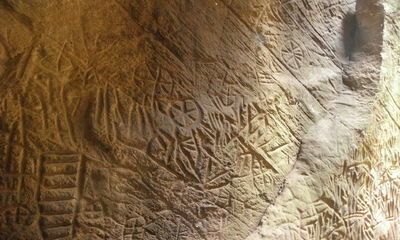 You can see here carvings belonging to Neolithic and Mesolithic age. The human figures of these caves have raised hair and some have masks. They all have archeological significance and are interesting too. Along with these pictorial carvings, you can also watch Tamil and Brahmi Script in Edakkal caves. Edakkal is said to have some links with Indus Valley Civilization too. Around 400 signs were discovered recently, which had shown its relationship with the ancient civilization. The prominent among them was ‘a man with a jar cup’. The visiting time to Edakkal caves is from morning 9:30 to evening 4:30. 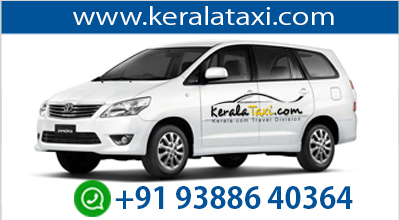 You can reach the lower part of the Ambukutty hills via bus or car and from there you have to climb the hills. Till mid way of the hills, you can make use of the jeeps arranged by the DTPC. To enter the caves, you have to give a reasonable entry fee.